Mwangelwa Muteto started attending Northrise University’s Center for Professional Studies in January 2012 after saving enough money from his full time job to pay for tuition. Mwangelwa graduated in June 2016 with a Bachelor’s of Finance and Accounting degree. Here is the rest of the Mwangelwa’s journey of faith. Mwangelwa was born and raised in Ndola, Zambia and attended Simba School from reception (kindergarten) through grade 12. Mwangelwa has two older brothers and one older sister and three younger sisters. While his family was able to afford to send his older siblings to university in the U.S., the family fell on hard financial times when it was time for Mwangelwa to pursue a higher education after graduating from high school in 2006. Mwangelwa was disappointed he would not be able to attend college in the U.S. like his older siblings. While Mwangelwa worked with his dad after high school through 2010 he continued to dream about going to college and completed some technical courses while pursuing entry into Zambia’s two public universities; the University of Zambia and Copperbelt University. By 2011, Mwangelwa thought that he may never be able to go to a university and pursue his dreams. But as Mwangelwa stated, “I had faith in God”. Mwangelwa attended church with his family growing up and gave his life to Christ and was baptized in August 2005. His family has been a source of encouragement throughout his life and especially in the difficult times. The Northrise University family has helped him grow closer to God and broadened his Christian worldview. After a friend told him about a job opportunity Mwangelwa was hired by Lyan Mineral Exploration in October 2011 as a data entry clerk. Soon after starting his new job that same friend encouraged him to attend Northrise University. Mwangelwa researched Northrise University and was encouraged as he read about the Zimba’s journey of faith to establish Northrise. He applied for admission soon after and begin attending classes and pursuing his dream of a university degree in January 2012. “The first year was very difficult since I was in a new job and also attending school. Transportation was especially challenging since I did not have a car and I lived 7km from work and another 5km from school but, I had faith in God”. At first Mwangelwa’s employer would allow him to leave early to make it in time for classes, but after a while leaving work early was no longer an option. God provided transportation through friends and co-workers and with hard work and planning Mwangelwa was able to make it through the first year of his program. 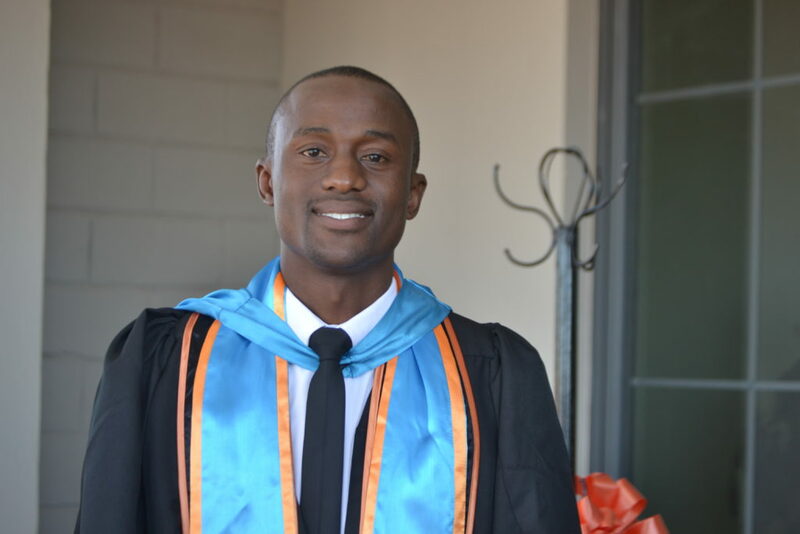 While studying business, finance and accounting Mwangelwa also enjoyed and grew spiritually through relationships with faculty and fellow students and the Christian Thought and Practice (CTP) classes that were part of his degree program. “When studying other major religious you realize more and more the difference and the truth of Christianity,” Mwangelwa said. He also shared that the CTP classes gave him a firm Biblical understanding of marriage, family and other relationships that he will carry with him the rest of his life and that studying in a multi-generational environment in the classroom and in study groups has helped him respect and understand different perspectives and work with others more effectively. It has been a long journey with both challenges and rewards. Mwangelwa’s drive for being excellent at what is good has been beneficial for him in both work and study. While starting in 2011 as a data entry clerk, he has been promoted several times, most recently in May of 2015 to the position of Assistant Accountant in his company. He is often asked to do additional work and special projects due to his strong work ethic and ability to get the job done right. In 2014, his employer asked him to provide receipts for fees that he had paid to pursue his degree program at Northrise. A few days later Mwangelwa was amazed that the company had reimbursed him for all of his school expenses incurred in 2013. In fact, Layn Mineral and Exploration paid for 3 of the 4 years of Mwangelwa’s degree program. Mwangelwa has faith in God. In the future, Mwangelwa would like to continue to work in financial management and accounting and plans one day to start his own business. He would like to expand his knowledge in marketing and agriculture as well. He currently owns a small farm and is learning how to grow crops and manage operations. He would also like to pursue post graduate studies either in Zambia or abroad. On June 4, 2016, Mwangelwa celebrated his graduation with family and friends. Proud parents Victor and Alice Muteto were in attendance. They had watched their son grow up, give his life to Christ, walk in faith, work in the family business, start a new job with a major company and pursue his dream of attending university and earning a degree. This day, all of the answered prayers, persistence, study and hard work would be celebrated and God be praised. Today, Mwangelwa had one more assignment that no other graduate had been given. He would have to do one more thing before walking with the Class of 2016 and receiving his degree certificate and moving his teasel from left to right, he would need to deliver the Valedictory Address to his classmates. He did and he did it well. Mwangelwa has faith in God and His future is bright!